Edwin Dickson had a Black Widow all the time on the point of his salmon cast. The one shown here is a variation, where the traditional rolled mallard wing has been substituted by bucktail and crinkle-flash. It catches better later in the season, or where you expect to get fish which have already been in the river for a while. It can be a very effective fly then, particularly when fished on the point. I use single hooks size 8 or 10; the pattern doesn't work well on bigger ones. Additional Information: Well known angler # 1 is making up a new cast. Well known angler # 2: the water looks great now. Well known angler # 1: we should get a fish at some stage today. 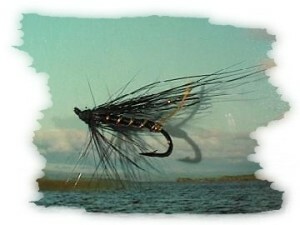 Well known angler # 2: what flies are you putting on? Well known angler # 1: ( browsing through his fly - wallet ) don't know really, maybe try with only two first, that black one of yours and an anchor on top should do. Well known angler # 2: uhu. Well known angler # 1: ( putting a fly on ) do you know that I always had my best days salmon fishing after a very successful night of love making? Well known angler # 2: hu? Well known angler # 1: ( putting a second fly on ) yea. Well known angler # 2: uh. Well known angler # 1: ( producing a little brown bottle from a pocket of his waxed jacket ) so I asked the wife to volunteer. Well known angler # 2: ohu! Well known angler # 1: ( shaking little brown bottle ) you see, the salmon has a very strong sense of smell. Well known angler # 2: oh. Well known angler #1:( applying a drop to each fly ) you can try a drop if you like. Well known angler # 2: o! Conclusion: some anglers would put anything on their hooks, when guaranteed a fish.